A bride and groom pose for photos in the grounds of the Bank house Hotel in Worcestershire. Steph and Rich got married at Saint Georges Catholic Church in Worcester City Centre, before moving on to the Bank House Hotel in Bransford for their wedding reception. The Bank House also offers an 18 hole golf course, and after a quick trip to the first tee lake for some couples photos, we made our way back to the gardens at the rear of the hotel. 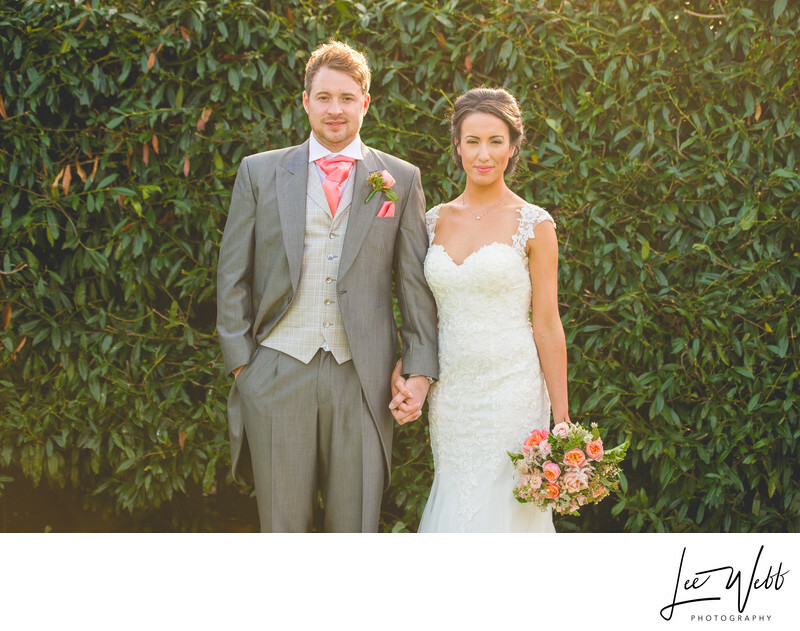 The garden is ideally placed, allowing you to take photos with the sun behind the bride and groom which is important when it comes to wedding photography - the sun being behind the couple means there are no harsh shadows and no one has the sun in their eyes. If you're also in the right place in the garden, you get an amazing view of the Malvern Hills. The set up for this photo almost couldn't be any simpler. I placed the bride and groom in front of this tall bush in the garden, that gives a neutral colour and a repeating background, ideal for not taking anything away from the married couple. This photo was taken late in the day, and the sun, now low in the sky, gave the beautiful warm glow you can see here. Location: Bank House Hotel, Bransford, Worcestershire.